This is a French formal type of garden, not an English type. Geometrical exactness is being assured by the taut-drawn cord which passes just behind the bearded figures spade. All these symmetrical beds are being prepared for growth, being sodded, raked, seeded, watered, set with plants. Potted shrubs and bushes stand just left of center. In the upper right quadrant, sheep are sheared by 2 workers under the thatched eaves of the barn and by an energetic woman outside. Further right a basket of sheared wool is carried. Immediately to the right of the shearing and behind the lady of the estate, 2 workers fasten vines on a bower. The supporters at the end of the bower are a pair of armless classical statues. At upper center, back of the flock of sheep, stand some calves, amidst lambs nursing from grazing ewes. Still further back, against a wall, beehives are seen. Through a gate at the center a woman carries on her head a bag of grain. Beyond workers are cultivating fields and pruning an orchard. Still further back stands a church tower. At the horizon lies a sea on which tiny boats sail. In the sky a long “v” or “u” of migrating birds provides an authentic Bruegel touch. At left rear is the castle whose owners possess all this wealth and abundance. Around it is a moat, which does duty as a stream for recreational activities. It leads past a pleasure bower with 2 levels. Richly clad gentlemen and their female companions are feasting below, and there seems to be dancing above. Couples lie on the grass drinking and singing. A musician plays the 16th century equivalent of a cello. In spring a young mans fancy lightly turns to thoughts of love – or some facsimile therof. the earnest, unremitting toil of the workers in the garden contrasts sharply with the drinking and dalliance in the pleasure bower. 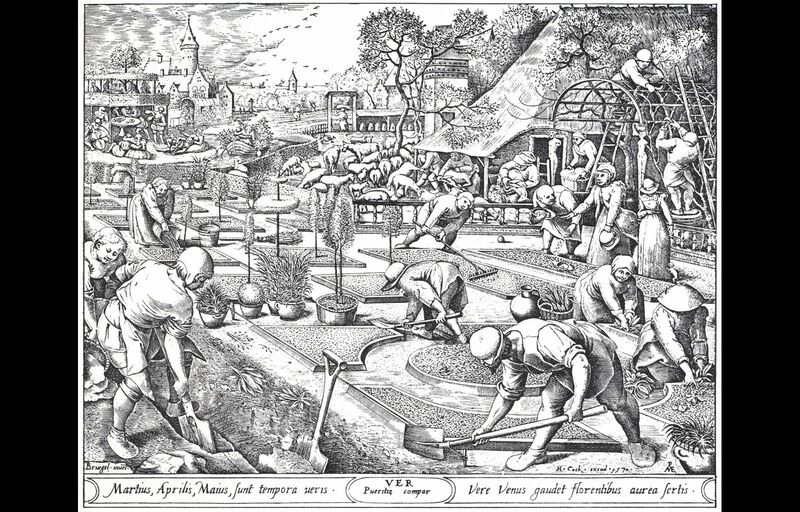 One of the garden workers – the woman pouring water from a seedling bed – is obviously old. Others are middle aged; still others, apparently young. 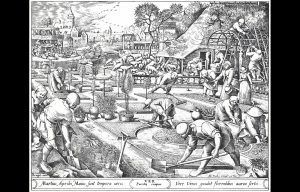 At the extreme right small plants are being bedded by a working woman whose hat, like an inverted bowl, covers her head completely – another characteristic Bruegelian touch. This entry was posted on Wednesday, May 21st, 2014 at 7:17 pm and is filed under art & books. You can follow any responses to this entry through the RSS 2.0 feed. You can leave a response, or trackback from your own site.